NEW YORK (AP) — If you're a little surprised to discover that alt-country star k.d. lang is coming to Broadway, so is lang. "It is outside my comfort zone. It is something that I never thought I'd be doing," the Grammy Award-winning singer-songwriter says. "I just try to follow my heart and my muse and the opportunities that arise for me and what's inspiring me." Lang will take over from Fantasia Barrino as the second star vocalist in "After Midnight," a musical celebrating Duke Ellington's years at the Cotton Club nightclub in Harlem. 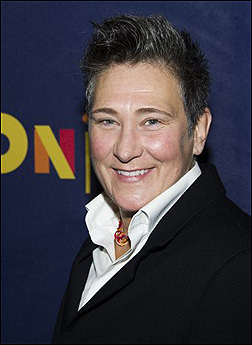 Lang, blessed with androgynous looks and a sensuous voice, starts performances Tuesday and will end her run March 9. "After Midnight" is a sort of candy sampler of some two dozen musical numbers that showcase dance, jazz or singing. Lang will be called on to sing "I Can't Give You Anything But Love," ''Stormy Weather," ''On the Sunny Side of the Street" and "Zaz Zuh Zaz." "I imagine it's going to be quite a different place than Fantasia," she says, laughing. "I want to approach things from a naive point of view, from a reactionary, emotional point of view." Lang, 52, has won four Grammys and is perhaps best known for her cover of Roy Orbison's "Crying," her interpretation of Leonard Cohen's "Hallelujah" and her hit song "Constant Craving." She also caused a stir in the 1980s when she posed on the cover of Vanity Fair in a barber's chair being shaved by supermodel Cindy Crawford. Although musical theater was never one of her interests growing up, this self-styled "musical nomad" will now be working with Wynton Marsalis on Broadway with a 17-peice band. She even agreed to do the show before seeing it. The Associated Press sat down with lang shortly after her arrival from her home in Portland, Ore., and asked her about this odd left turn and why she almost didn't take it. AP: How did you get lured to Broadway? lang: My No. 1 attraction was the music and the original Duke Ellington arrangements. I mean, that's a no-brainer. I look at my life as a lifelong learning process of being a vocalist, and that's like going to one of the greatest schools. And working with a big band onstage? That's a wonderful, wonderful opportunity. AP: Is it true you initially passed on this? lang: I tried. I did the first time they asked. I said, 'No' because I'm kind of stuck in my ways. I do what I do. But then they came back to me and I had thought about it a lot and came to the conclusion that you can't turn it down. lang: I was concerned that I had to act or that I had to perform in a way. To me, the most important thing is diving into the emotional narrative of the song. To me, that's everything. When they assured me that I could perform the songs the way I felt them and I didn't have to change to fit the show, that made a lot of sense to me. AP: What did you think after seeing it? AP: Do you have a back story for your character showing up at the Cotton Club? lang: I kind of figured that I'm a misfit in society. I work up there. I don't have a lot of money. Maybe I know somebody in the band or maybe I have some ties to the people who are the patrons. But somehow I get onstage. I'm broke. I go after work and I get to sing with the band a few songs. But I really don't fit in. AP: What will you wear? lang: A suit by Isabel Toledo, who did the costumes. I don't think they're going to be gowns. I think Fantasia's got me on that one. AP: If it all goes well, might we next catch you in a revival of, say, "South Pacific" or "Gypsy"? lang: No. It's not who I am. I mean, I may be completely singing — pardon the pun — a different tune after this experience, but up this point, no. I would say not. AP: Do you think this might open a new door for you? lang: It may even shut a door (laughs). I may even retire after this. I don't know. I honestly have no idea.